Gold Metal Recyclers is one of the largest metal recycling companies in the United States. The Dallas processing yard encompasses about 38 acres and ships approximately 200 to 300 trailers of scrap metal and concrete a week. Gas Forklifts are primarily used to transport the scrap from trucks to bailers or other types of processing machinery. 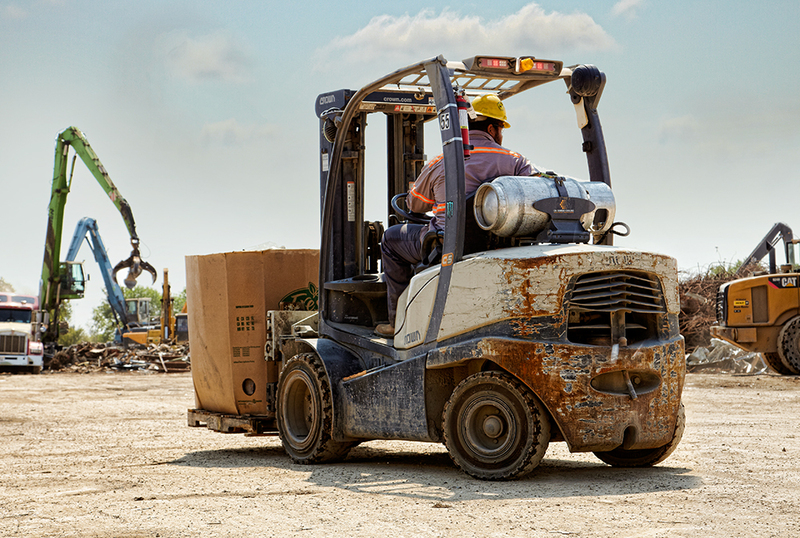 Gold Metal’s gas forklifts operate in 40° C heat with heavy thick dust and debris in the air. Working seven days a week with two shifts a day, Gold Metal runs each of its forklifts approximately 3,000 hours a year on average. The gas forklifts move large pieces of scrap metal and concrete. Given the heavy use and high hours, the customer’s number one challenge is downtime, often due to clogged radiators and overheated transmissions. According to Joel Back, production manager at Gold Metal, his operators were manually clearing the radiators on competitor trucks at least once a day. Each clearing would take 15 to 20 minutes and require that the forklifts be in the maintenance bay. The Crown C-5 Series gas forklift is built with industrial components and features that excel in the harshest environments. The Crown C-5 Series features an industrial engine and advanced engine cooling and radiator clearing system. A dual open-core radiator provides separate cooling for the engine and transmission. On-Demand Cooling automatically clears the radiator of dust and debris each time a user starts the Crown C-5 gas forklift by reversing the fan direction to clear the radiator. In as little as 18 months, Gold Metal realised an extra 175 hours in availability due to its operators moving scrap metal and not manually clearing the radiator of their gas forklift once a day. Crown, one of the world’s largest material handling companies, has a reputation for prizewinning product design, advanced engineering, user-friendly technology and first-class customer service. Vertical integration is at the core of Crown’s corporate philosophy, incorporating the design, production and distribution of innovative, pioneering solutions that enable customers to systematically increase the productivity and overall performance of their business operations. Alongside the company’s comprehensive range of forklift trucks, Crown also develops automation and fleet management technologies. The company has its Head Office in New Bremen, Ohio, operates regional headquarters in Germany, Australia, China and Singapore, and employs over 10,000 people around the world. The service and distribution network extends to over 500 sites in more than 80 countries. Further information on Crown and the company’s ideas for helping customers advance their operational productivity can be found at www.crown.com.